Farmers and food growers can play a role in managing the urban food-water-energy nexus. Process of urbanization today disable the metabolic agency of urban food growers. ‘Urbanising in place’ seeks to define components of an “agroecological urbanism”: a model of urbanisation which places food, metabolic cycles and an ethics of land stewardship, equality and solidarity at its core. Working with communities of practice in Rosario, Riga, Brussels and London, the project will identify ways of structuring urbanization that value proximity, account for the reproduction of nutrients and soils, mobilize technologies and decommodifi ed value chains in order to keep the control over resources localised. ‘Urbanising in place’ is one of the selected projects of the Sustainable Urbanisation Global Initiative (SUGI) Food-Water-Energy Nexus, jointly established by the Belmont Forum and the Joint Programming Initiative Urban Europe. The cooperation was established in order to bring together the fragmented research and expertise across the globe to find innovative new solutions to the Food-Water-Energy Nexus challenge. SUGI-FWE Nexus is supported by the European Commission and funded under the Horizon 2020 ERA-NET Cofund scheme. Issue 33 of the UA Magazine is a joint effort of the RUAF Foundation and the Centre for Agroecology Water and Resilience (CAWR). 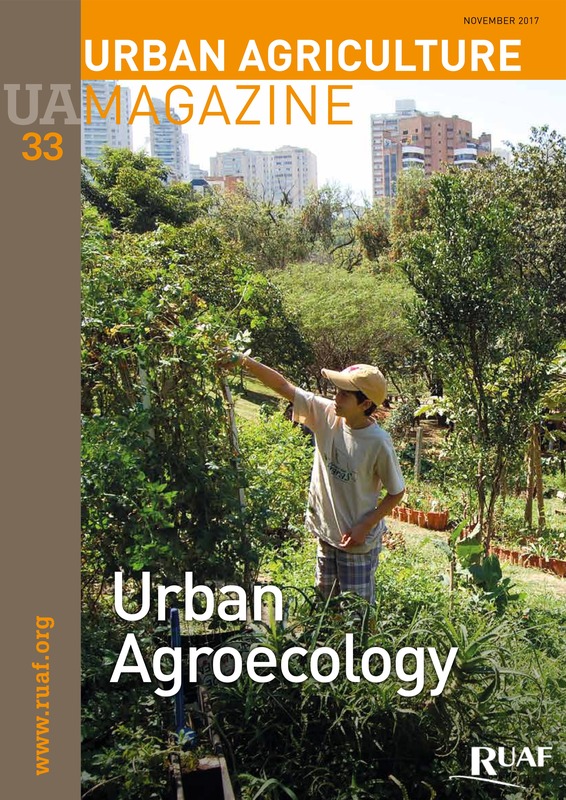 It aims to articulate and document the emerging field of urban agroecology. Chiara Tornaghi and Michiel Dehaene wrote an article entitled “From Agriculture in the City to an Agroecological Urbanism: The transformative pathway of urban (political) agroecology”. Subscribe to our newsletters via the link below. We offer both a newsletter that keeps you informed of the SUGI project urbanising in place (2018-2021) and a newsletter of the International Platform on Agroecological Urbanism (to be launched). Do you have a specific question concerning the project itself, the international forum for an agroecological urbanism, or a specific case region (Riga, Rosario, Brussels or London)? Feel free to use our contact form, or contact one of the team members via the link below.